Ride in Comfort All Year Long! This Combo 12V Heater/Fan plugs directly into your cigarette lighter socket. Change from 12 Volt Heater to 12 Volt Fan Operation with the slide of a switch for greater comfort in all weather conditions. 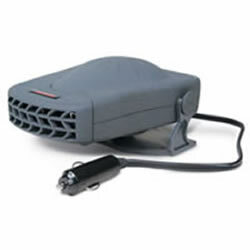 A handy in car heater that mounts semi-permanently on dash top or side panel. The swivel base allows adjustment to just about any position. To prevent personal injury do not mount in car heater on or near air bags or air bag covers. Perfect! Thanks for such a great product. Here in Ohio it takes about 10-minutes for the car to warm up enough to blow heat then the waiting begins again as the window begins to defrost. I've been sitting this heater on the dashboard while I wait for the engine to warm up. By time the engine's warm the window is completely clear. I love this heater! Thank you! Arrived quickly but I thought it would be bigger. Maybe if I head look at the size first. I will get a nother one for back seat passengers.